During his research into sensory perception in the 19th century, Ewald Hering required that the concepts employed — for example colour itself — should be derived solely by means of perception in order to avoid confusion with their physical or physiological causes. This implied a complete absence of any classification based on data extracted from the area in which the stimulus of a particular sensation originated. In the area of colour, this (for Hering self-evident) principle has, of course, been subjected to constant violation — many colour-systems have been created under consideration of aspects from both chemistry and physics. 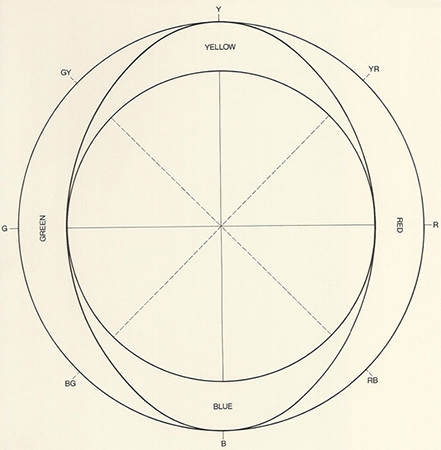 During the thirties, the Swede Tryggve Johansson (1905-1960) adopted Hering’s ideas and attempted to promote them in his own country by suggesting the colour-solid shown here rising above a circle divided into four equal parts — the colour quadrants — in which the four fundamental colours of yellow (Y), green (G), blue (B) and red are placed. In his 1937 system, Johansson portrays white as a point at the tip of his construction. Black (BK) is not given a fixed position, instead being placed at the lower boundary of each colour to occupy the entire base of the colour-solid. 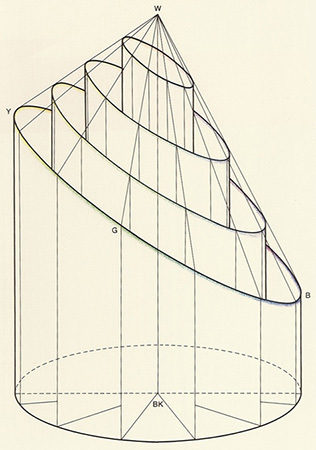 To the right, we show vertical sections through the solid, the lines of which in each case show from above downwards how the colours (C) of equal brightness, equal saturation, equal brilliance and equal intensity are all located within the system. 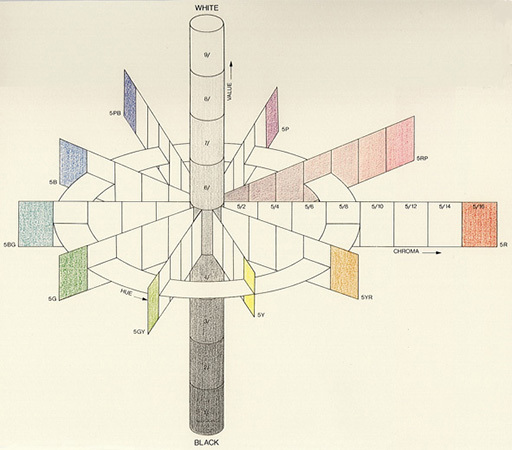 Johansson also had plans to utilise A. H. Munsell‘s ideas, and replaced Hering’s «degree of black» with a brightness variable reminiscent of Munsell’s value. He supplemented this variable with a further parameter, namely «clarity», which points to the «degree of darkness» later used in the DIN system. 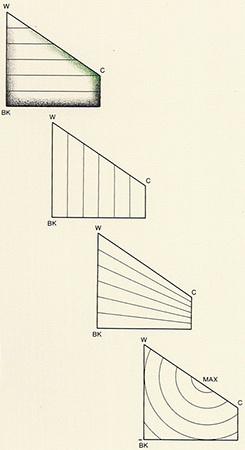 Johansson’s system became very popular and found wide appeal amongst teachers, architects and designers. Date: The Swedish physicist Tryggve Johansson presented his colour-system between 1937 and 1939. Hering — Munsell — Pope — Hesselgren — DIN — N.C.S. 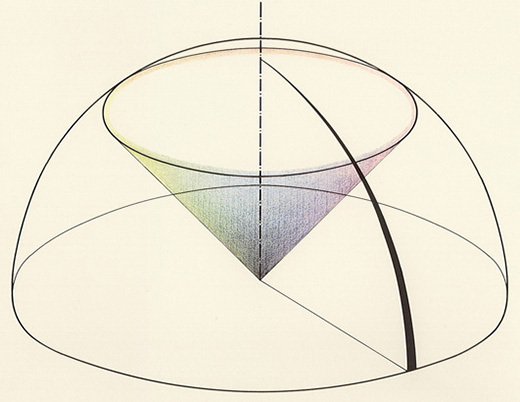 Bibliography: Hård, «Philosophy of the Hering-Johansson Natural Color System», Proceedings of the International Colour Meeting, Luzern 1, pp. 357-365 (1965); Die Farbe 15, p. 296 (1966); S. Hesselgren, «Why Color Order Systems?», Color Research and Application 9, pp. 220-228 (1984).